A simple and easy solution to those forgotten attachments in e-mails. Hasn’t it happened to you? Has this ever happened to you? You want to send a file to someone, so you write a nice e-mail explaining what it is; then you click the send button, and some minutes later you receive the reply: “ok, very nice, but … where’s the attached file?”. Yes, you forgot to attach the file. It’s a common but hard to avoid problem; a good rule is always attach the file before writing the e-mail, but aren’t there any better ways to avoid this? Some systems, like GMail or Thunderbird, have options to alert you when you try to send an e-mail which includes specific words (“file”, “enclose”, “photo”, …) but has no attached files. It’s a nice idea, but far from perfect: you will still miss files if the system doesn’t detect these words, or you will get an annoying alert about an attachment you don’t want to send. 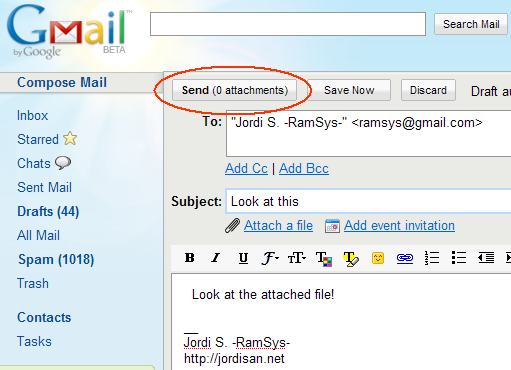 So when you are going to send the e-mail, you realize that the message has no attachments. Simple and effective, don’t you think so? Developers should be able to include this functionality easily in e-mail clients. Meanwhile, however, we can try to implement it using plugins or other customization systems. Greasemonkey is a system to allow the user to control the way they use the web, by customizing it with scripting. It works with Firefox with this addon installed. The number of attachments is computed when the cursor goes over the button. This is not the best implementation but a demonstration of how the functionality would work. The feature could be easily included by the developers (Mozilla, Google, Microsoft, … You know) in their e-mail clients. This idea is just one of the improvements our e-mail systems need, as I explained in a previous article (in Spanish).